Two miles inland from where it reaches the sea at Luce Sands, and a mile from the village of Glenluce, the Water of Luce has created a broad and fertile flat-bottomed valley between gently sloping hills. 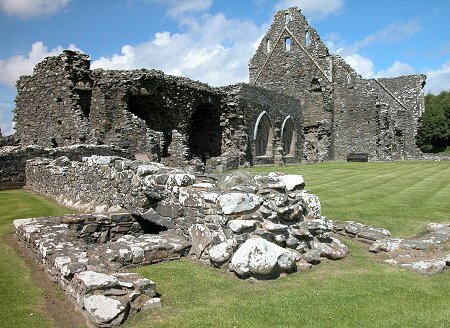 Some eight hundred years ago this quiet pastoral location became home to Glenluce Abbey. 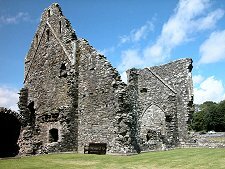 Glenluce Abbey was founded in about 1192 by Roland, Lord of Galloway. 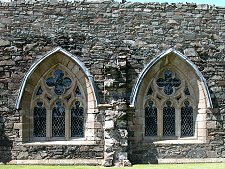 He asked Cistercian monks from Dundrennan Abbey near Kirkcudbright to set up a daughter-house here. 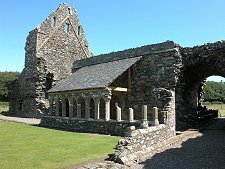 The first designated Abbot of Glenluce, whose name is unknown, would have arrived with twelve of the white-robed Cistercian monks and simply set to work clearing the site and building the abbey. The first stage was to build the east end of the church, so that worship could take place. 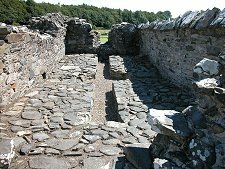 The remainder of the abbey church and the domestic buildings of the abbey then followed. In common with other abbeys, work would have continued for many decades. And once built, the abbey would have been subject to a fairly continuous series of renovations, extensions and revisions during an active life that continued over a period of some four hundred years. The most important part of the abbey was the abbey church. As usual this was constructed along the north side of the site so that its taller height did not cast the rest of the abbey in shadow. Today parts of the south transept wall still stand, but little remains above ground level of the rest of the church. To the south of the abbey church most other buildings in the complex were grouped around three sides of a square cloister, where the monks would walk and pass their time in silent contemplation. Today by far the best preserved parts of Glenluce Abbey lay on the east side of the cloister, part of which has been restored to give an idea of how the whole area would have looked and felt. Behind the restored portion of cloister is the chapter house. This was the second most important space within the abbey, where meetings took place and business was conducted. The structure on view today was probably rebuilt in about 1515. The windows were restored in the 1900s. 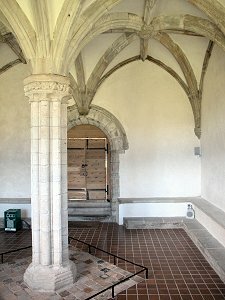 Above the chapter house would have been the spartan accommodation for perhaps 15 monks, while on the other side of the cloister was a range in which lay-brethren lived. The fourth side of the cloister, the south range, comprised the refectory and kitchen, but was later converted into a house. The foundations of a variety of outbuildings can be seen further to the south, while the more modern buildings to the north-west also house a small museum. Glenluce's position saved it from the repeated destruction that befell so many abbeys further east, but it still suffered from its fair share of disputes over land rights and ownership. One of these in 1544 led to the eviction of the monks, who then spent a year in temporary accommodation in Maybole in Ayrshire before the argument was settled. The end of Glenluce's active life as a monastery came with the Reformation in 1560. The monks who accepted the new doctrines were allowed to live out their days in the abbey, the last one dying in 1602. Part of the site was then converted into a house before being re-acquired by the church in 1619 for use as a manse. Over the following 300 years the abbey remains deteriorated through the forces of nature and through their use as a quarry for nearby building projects. 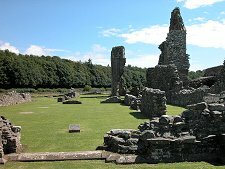 Glenluce Abbey passed into State care in 1933 and is today looked after by Historic Environment Scotland.